What was the prefabrication system of these homes? I take it the horizontal wall elements? Or were entire walls shipped to the site? It seems there was still a lot of custom building on site for these homes. If you read the Prospectus, you will see that the exterior walls were shipped as panels, with sheathing, siding and windows installed. Interior surfaces were not pre-installed to allow for electrical work. Of course, the wall sections had to be limited to a dimension that would fit a trailer, so some field joinery would have been required. Interior partitions were likewise shipped as framed panels, ready for finished surfaces once the utilities were in place. From the Prospectus I would assume that the roof system was constructed on site from components provided. It is really too bad the Model "C" was never built. It may be my favorite. It has some of the features of Model "B" with the high ceiling in the living room, but it is more horizontal (Wrightian). I agree, Paul. 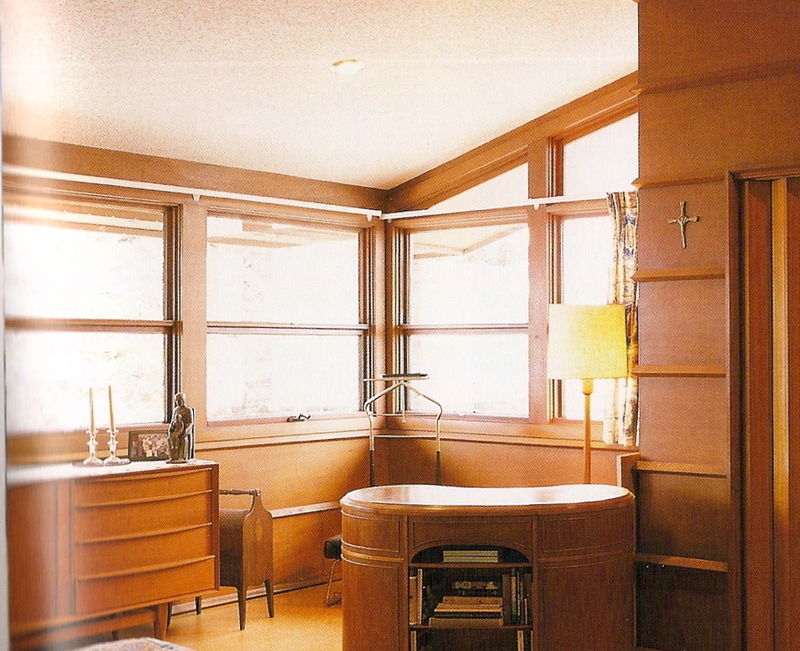 #3 looks more like FLW's work than the other two. 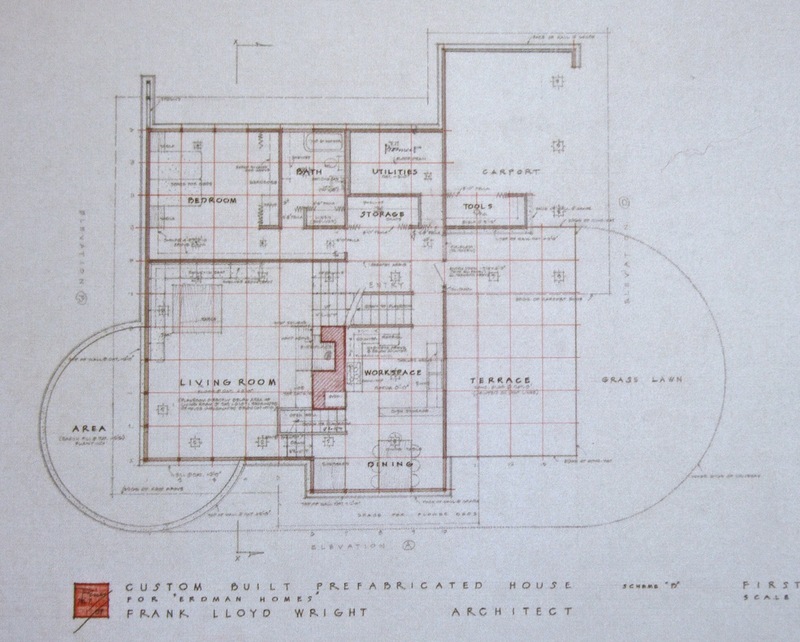 Like the ASBH buildings, the modest Cottage B-1, and many of the other unbuilt cottages of similar size, are more interesting than a lot of the larger houses that were executed. 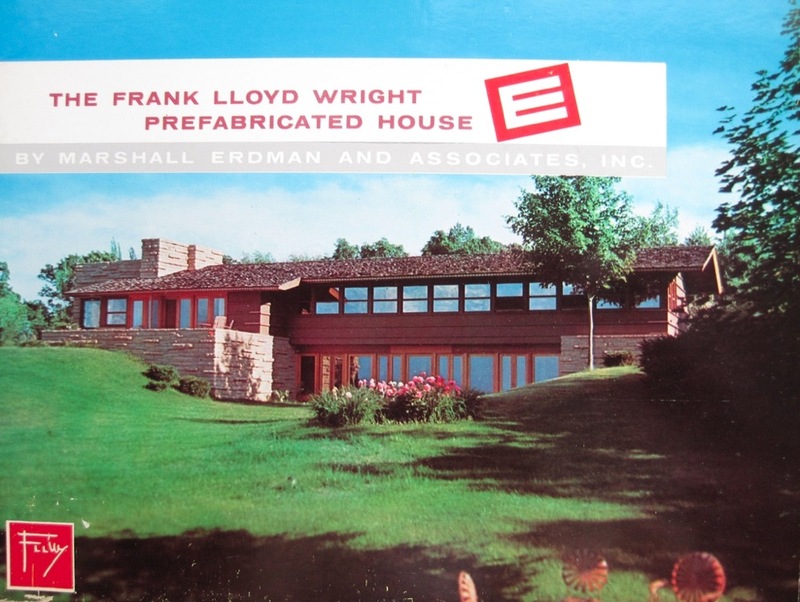 I'm going to go out on a limb and suggest the masonry base, end of wall trellis, and fascia details seen on the two-story Erdman Prefab are likely what Wright had in mind and evolved for the Model C in his drawings. Prefab of any stripe . . . 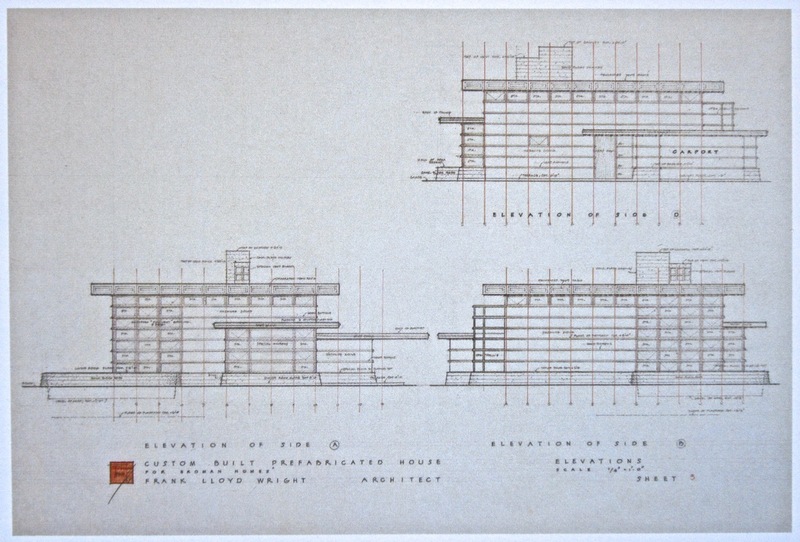 Here again are Erdman II elevations, as published in Taschen III, and two plans, the first from that publication, the second published in Monograph 8. Drum + 2'-0" (changed to, or from, 1'-0"). Stairs have been drawn and erased. Conc. Mat"; the driveway is called out as gravel. Does the note in the carport indicate that the majority of that space would have a graveled floor ? unpaved ground enters the enclosure, within which is the raised wood platform that is the floor of the house ? When were these prefabs removed from the market? "Edge of Conc. Mat"; the driveway is called out as gravel. Does the note in the carport indicate that the majority of that space would have a graveled floor ? Most of Wright's carports are gravel...some early Usonians had concrete: Suntop, Christie I know do...both were built by Harold Turner. Goetsch-Winckler, also built by Turner, has concrete now, but I'm not sure if that is original; the plan noted gravel. There are likely others. The incontinence of cars is not good for the tinted concrete finish. Shady carports, if paved, can become icy...again, salt on tinted concrete is not good. So, my question is, how many of those houses have gravel-paved carports, and how many have an extension of the slab as the paving material ? SDR, I think you're reaching a bit. I've seen McBean, and there is no 'Japanoiserie' evident. It's All-American! The drive and carport are concrete now, but may have been gravel originally. 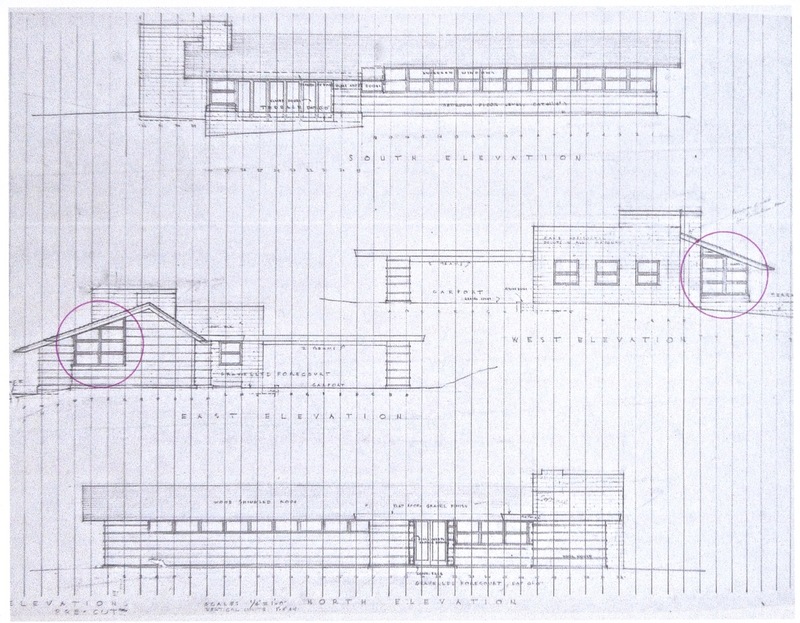 The rough drawing is preliminary; the almost identical as-built plans of Rudin and McBean differ significantly from the prelim. Just daydreaming there; I'm not suggesting any intentional reference. 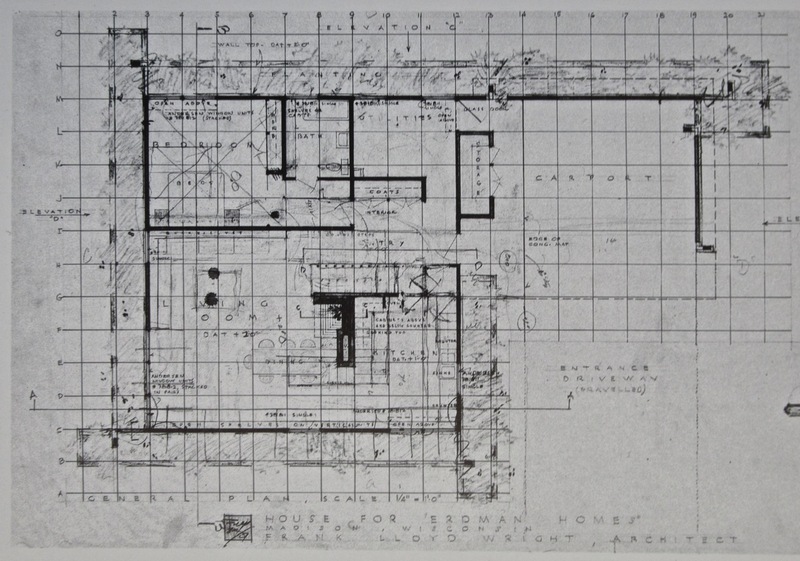 plans (besides Storrer's) of Fallingwater, or other stone-floored or carpeted Usonians, where the grid is shown on the plan ? There are numerous plans -- and elevations -- where unit lines extend to the edges of the sheet. This may be a separate if related phenomenon. plan despite the partial paving of the carport in gravel. The one story Model C truly does seem to be of a piece with the two story Prefab #2's. 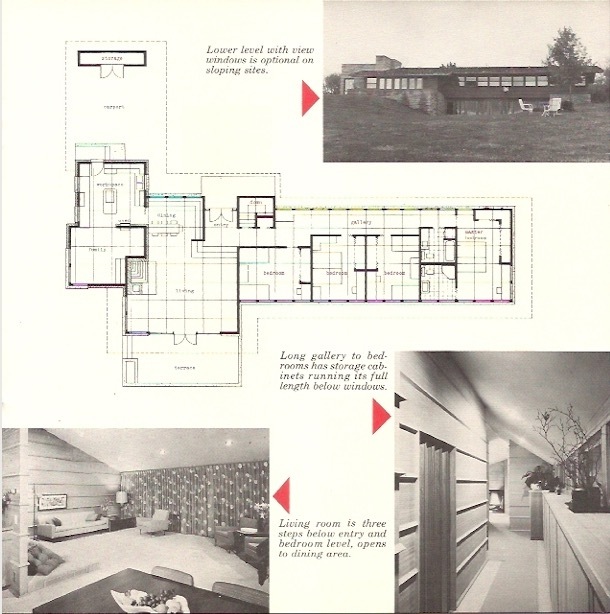 The two built versions of the #2 could be a used as a pattern book for the Model C.
Of all the FLLW unbuilts, this might be the one that could be reasonably executed with a high level of consistency to the original intent, provided its owner would be satisfied with a 1616 SF 3-bed, one bath house. I like it a lot. 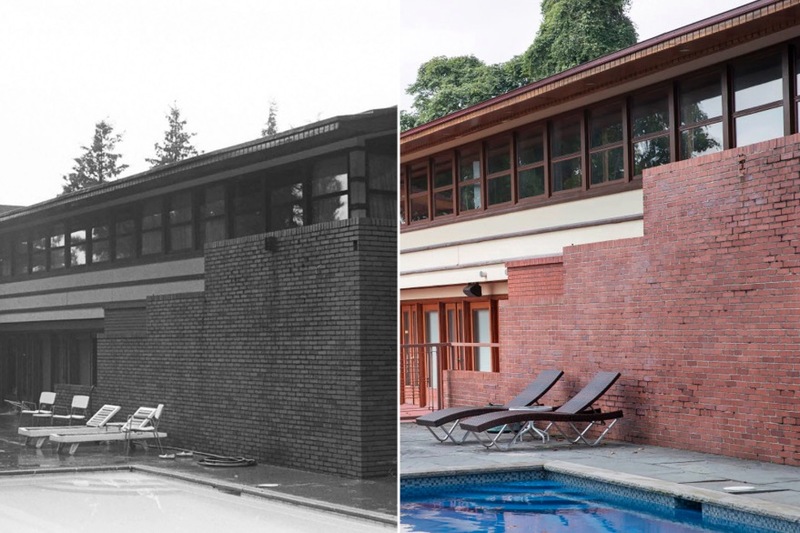 Like the faculty Usonian for FSC, it is an orphan residential design just waiting for a friendly circumstance . . . ? Constant readers will know that I've made a big deal about the unequal size of the upper and lower lites of the Anderson windows found on the rear elevation of Erdman 1 houses. 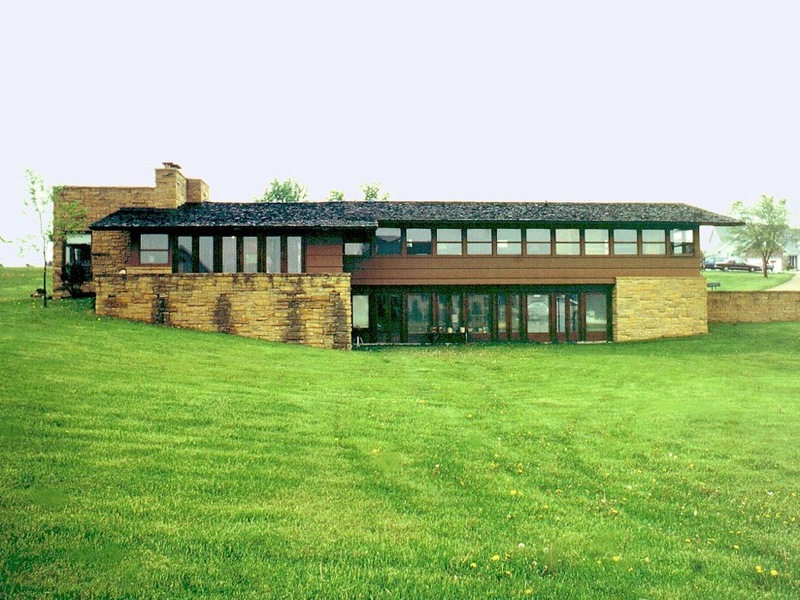 of windows at right cover the "extra" glass of the upper lites, making them appear equal in size to the lower ones -- would also operate in the flesh, thanks to the reflection of daylight being blocked by those same eaves ? It is difficult to find an exterior photo in which this effect doesn't operate; only one pair of images below reveals the discrepancy to any degree. Magic !